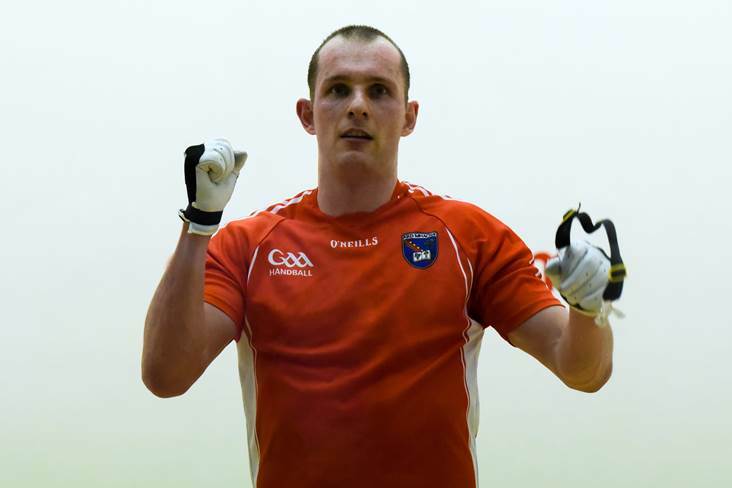 Perseverance paid off for Charly Shanks when he defeated four-in-a-row chasing Robbie McCarthy to claim a maiden All-Ireland men's senior 40x20 handball title in Kingscourt, Co. Cavan yesterday. The Clann Eireann player became the first Armagh man and only the second Ulster man to win the coveted title when he powered to a 21-4, 21-14 victory over the champion and hot favourite. It was a sweet victory for Shanks who had lost the last two finals to his much-vaunted Westmeath counterpart. Cork's Catriona Casey retained her ladies senior 40x20 crown with an emphatic 21-5, 21-4 victory over Martina McMahon from Limerick, while there was further successs for the Rebel County when Mallow's Tadhg O'Neill defeated Kilkenny's Eoin Brennan 21-14, 21-11 in the minor decider and Tadgh Carroll trumped Wexford's Daniel Kavanagh 21-16, 18-21, 21-7 in the intermediate final to seal his place in the senior ranks.